The Novation MiniNova Virtual Analogue Synth is the ultimate in compact studio and live synth performance, with its quick-access interface, incredible sound creation possibilities and retro, stylish design. 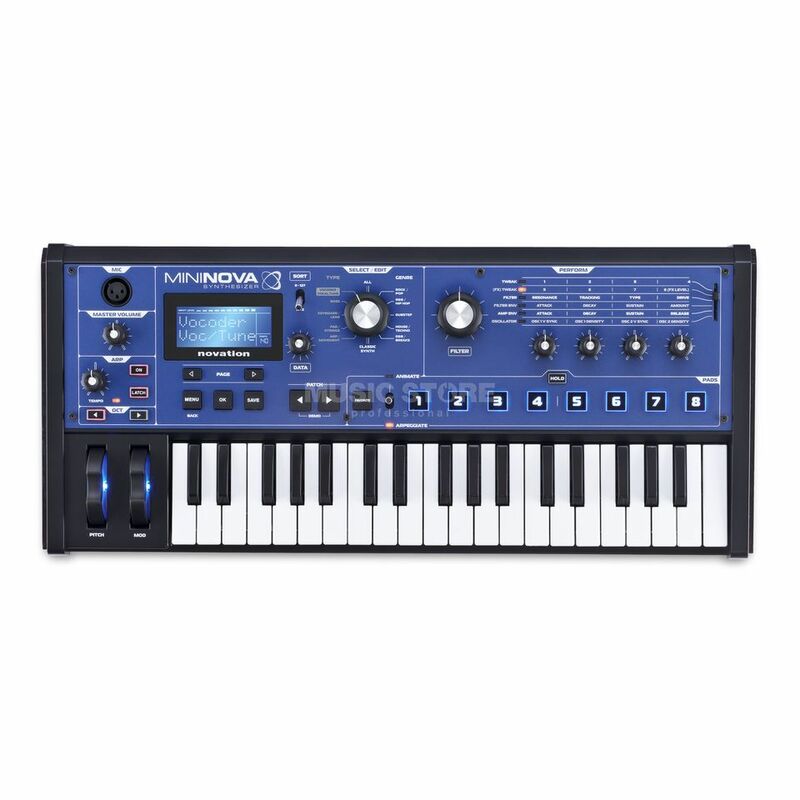 The Novation MiniNova features the impressive UltraNova sound engine, complete with all of its emulated and otherworldly sounds, but housed in a smaller chassis. Novation have made sure that sounds are quickly selectable and editable thanks to a core category-selection knob and a wide range of buttons, encoders and sliders that can then be used to select specific patches and edit parameters swiftly. There are 256 onboard sounds on the MiniNova to edit, with as many as 18 voices available at any one time, while user patches can be created in addition to these. The edits can be made in real-time thanks to the hands-on control surface, enabling the possibility of live articulations or adapting parameters in perfect context as you play. Separately, the MiniNova's effects can be added to each of these voices - up to five at once - allowing the potential for gigantic tonal stacking and layering. The MiniNova includes software that allows users to edit and catalogue patches in a handy library interface, using the USB connection to hook up to a Mac or PC. The 37 key mini-keybed can be used in conjunction with this and the MIDI I/O to act as a fast and responsive controller keyboard with DAWs and plug-ins, too. The MiniNova's vocoder patches span numerous retro and modern sounds, and also feature a brand new setting: VocalTune. This can be used to create the auto-tune effect heard on a large number of modern records, and can either be applied subtly to better increase pitch accuracy or heavily for a more staggered warping sound. For astonishing amounts of power in a slight and dynamic-looking chassis, the MiniNova is in a class of its own. Novation's new creation is an ideal addition to a live setup or project studio. This is my fist keyboard, but I feel myself like I was a keyboard player all of my life. Play on it is a great fun! Classical? It has sounds like piano, organ, strings but they sounds very electrical - and this is the point, the classical stuffs sounds very modern in this beauty. Dubstep, techno? OHH YEAH baby! Creating your own electronic music never was as easy. Any other genres? Of course! This stuff blows your mind out of thinking in genres. And for me the biggest experience with MiniNova - the vocoder. Now I can singing :) without hurt anybodys ear. I dont know how they could create this pure awesomeness for an affordable price. Small but powerful synth for a great price! Very nice synth for the price. On the Novation website you can download many more presets for free. Some of the presets are very well known classics. The mic and vocoder are a pure bonus. Honestly it is well worth it and cannot wait to use it live. I use for my music production and very powerful synth. Thanks to Music Store for fast delivery. The MiniNova fits my musical desires very well. I play a lot of classic rock and prog rock, so most of the time I'm just playing a Hammond, Rhodes, or piano sound. Sometimes however I need a synth sound for a lead, or an occasional pad/string sound; this synth delivers! The only thing that I really don't like is the mini-keys, but I suppose if you want full size keys you could just buy the UltraNova, or use a full size midi keyboard to control the synth.